Marie Gilvey poses with one of her custom handmade necklaces. Holiday music filled the air of the gymnasium during the 2010 Holiday Bazaar held at Lake Ridge Elementary School on Saturday, December 4, 2010 from 10AM – 2PM. It was the place to be as 17 vendors displayed their creative skills by offering arts and crafts as the holiday shopping season moved into full gear. Shoppers young and old made their way from table to table, some younger (shoppers in training), purchased “double-secret-decoder-don’t-tell-mom-and-dad” gifts for their parents—whoo hoo! CorseCrafts donated bead jewelry set for giveaway (click for enlargement). While parents were shopping, the kids had great fun with art activities at nearby tables. There was a drawing for several door prizes as well. CorseCrafts donated a beautiful bead necklace, bracelet, and earring set for the giveaway. 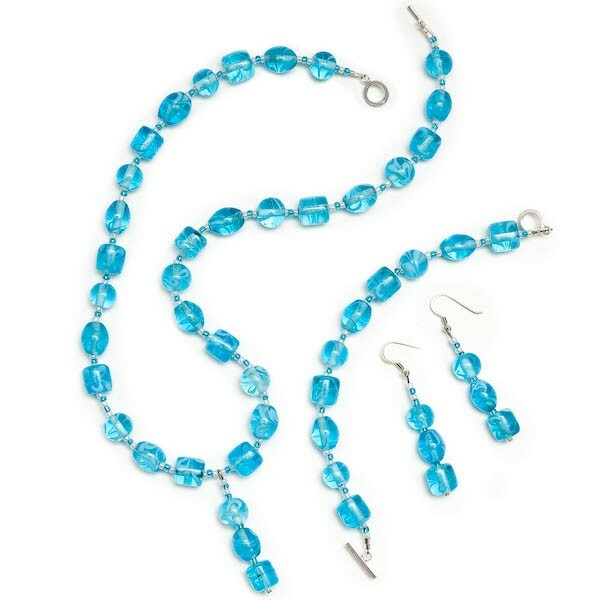 This set, originally valued at over $40, included an 18″ neckace, 7″ bracelet and 2″ dangling earrings made with aqua glass beads and sterling silver clasps and posts. Christopher’s miniature Christmas tree with working lights add holiday cheer to our display table. Marie had several new items to show at her table which was improved dramatically by the addition miniature Christmas trees adorned with working lights and hanging ornaments donated by her son Christopher. Be sure to check out the slideshow (below) to see the other one. CorseCrafts would like to thank the Lake Ridge Elementary School PTO and DeAnna Vasquez for selecting us to participate in this event. We will certainly want to attend again in 2011. Would you like to meet Marie Gilvey in person. Be sure to look for us at the 2010 Gar-Field H.S. 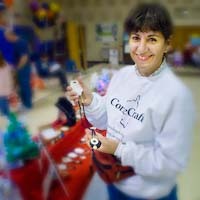 Orchestra Booster’s Holiday Craft Show this coming weekend, December 11th from 9AM – 3PM. Marie has several brand new pieces of jewelry that have not even been made available online as yet. Stop by our table and find out how you can get in on her FREE JEWELRY offer. This is possibly the largest craft show in Prince William County during the winter—you won’t want to miss it.